WhenToWork allows you to create multiple shifts per day for an employee, but in general tries to prevent you from “doublebooking” employees to more than one shift at the same time. 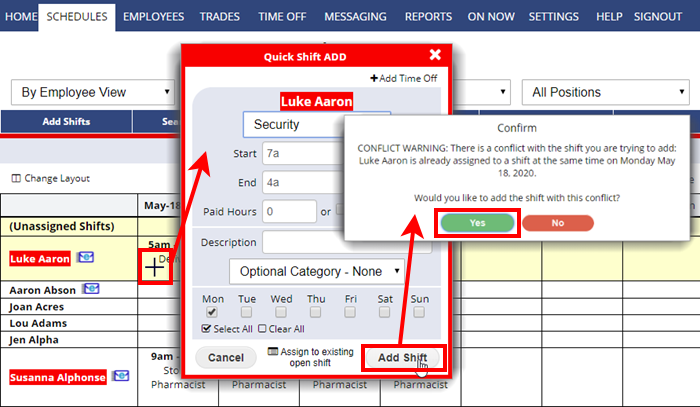 If you add a shift that overlaps another shift for that employee you will see a warning and you can agree to override that alert. You can then see the two shifts reflected on that day. add shift for employees who are on call for the week. Of course, the particular employee who is on call for a week also work his/her normal shift.